Mike Morgan is currently a Coordinator – Emergency Telecommunications Systems for OETS. He began his career at the age of 18 as a Cherry Hill Police dispatcher. The following year he began employment at the Camden County Alarm Room as a fire and ambulance dispatcher. Mike was a volunteer EMT with the Ashland Ambulance Squad and an Assistant Chief and Fire Marshal with the Woodcrest Fire Company, in Cherry Hill. In 1982 he returned to Cherry Hill Police as a police officer. He stayed involved with communications, serving as a communications supervisor and training unit instructor. In 1989 he was transferred to the Services Division to work on the implementation of the 9‑1‑1 network. Mike worked on the rewriting of the Communications General Order and the Comprehensive Radio Needs Assessment. As a lieutenant, and later captain, he was responsible for the installation of a new PSAP with an 800 MHz trunked radio system for the town. He also served as the Emergency Management Coordinator. Mike retired from the police department in November 2003 and started working for OETS the following week as the State migrated from the Rockwell Network to the Nortel Network. Mike still resides in his Cherry Hill home with Karen, his wife of 30 years, and dog, Bailey Kissangel. His three daughters have left the nest. One is a neuroscientist, one a police officer, and one is studying to be a large animal vet. Jason Lezcano is employed at the Morris County Law and Public Safety, Communications Division, where he serves as a 9‑1‑1 Systems Operation Coordinator and is responsible for the oversight of personnel and day to day operations of the Communications Center’s Floor. He began his career in public safety in 2003 with the Denville Volunteer Fire Department, where he served as volunteer firefighter and worked his way through the ranks to First Assistant Chief. In 2005 Jason began working for the Town of Dover Police Department where he served as a Telecommunicator for 5 years. In 2010 Jason began working for Morris County as a Telecommunicator – later promoted to Senior Telecommunicator and was assigned to the training division, where he was responsible for training of new hires. Jason also serves as the agency’s Alternate TAC and is responsible for record keeping and training of staff. Region North includes the following counties: Bergen, Essex, Hudson, Passaic, Morris, Sussex and Warren. Padre began his involvement in Public Safety when he was appointed as Chaplain to the Stratford, CT, Police Department in 1977. Parochial Transfer took him to Ohio where he became an active Firefighter/EMT with the Barton Volunteer Fire Department, rising to the rank of EMS Lieutenant. He also served as Chaplain to the Belmont County Sheriff’s Department. Reassignment brought him back to New Jersey in 1987 and he began a 12 year career with McCabe EMS, attaining the rank of Lieutenant and Midnight Tour Supervisor. In 1999 he accepted appointment as 9‑1‑1 Coordinator and Communications Supervisor with the City of Bayonne Police Department, his current position. He has also served as Bayonne PBA Chaplain since 1988 and is the Certified NECI Communications Trainer for the Police Department. 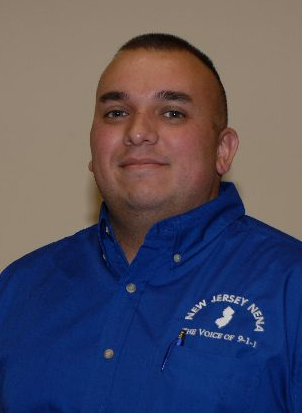 He has been a member of NJ-NENA for over 10 years and has served as North Region VP for 7 years. He considers the 9‑1‑1 Community and Public Safety Services to be a part of his priestly ministry and looks forward especially to the Annual Conference where he interacts with all our members and he considers everyone in NJ-NENA to be his friend and associate. Padre is currently Pastor of St. Mary’s Orthodox Church in Bayonne. Region Central includes the following counties: Hunterdon, Mercer, Middlesex, Monmouth, Somerset, Ocean and Union. Dawn began her career at the Ocean County Sheriff’s Department in October 1990 as a per diem employee, hired to enter data into the Department’s first CAD system. Once this job was completed, she was retained as a permanent employee and began training as a dispatcher in November 1991. Dawn worked her way up through the ranks to Senior Supervising Communications Officer. She was the training coordinator, custodian of records and wore many hats at communications center. In 2012 Dawn accepted the position of 9‑1‑1 Coordinator at the Monmouth County Sheriff’s Office. 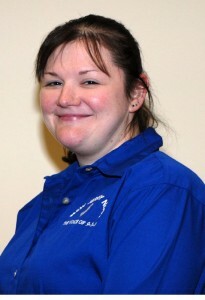 Dawn has been an APCO member since 2000, NENA member since 2002, NECI member since 2003. Dawn is a certified APCO PSTI instructor and State of New Jersey Police Training Instructor. Dawn has been married for 21 years, has 1 son, 2 step children, 1 dog and 2 fish. Dawn’s hobbies consist of exercising, she likes to run and has done the Walt Disney World Marathon in 2008 and most recently the Long Branch Half Marathon 2011; she also enjoys watching her son at karate, enjoys quality time with friends and family and loves vacationing in the Florida Keys. Region South includes the following counties: Atlantic, Burlington, Camden, Cape May, Cumberland, Gloucester and Salem. Monica has been a NENA member since 2001, and has served as the South Region VP 2004 to 2011. She received her ENP (emergency number professional) certification in 2007. Monica began her career in Public Safety in 1978 at Burlington County Central Communications, as a dispatcher/calltaker. Over the years she worked her way up to shift supervisor, and eventually to the County 9‑1‑1 Coordinator and Custodian of Records. Monica is a certified telecommunicator instructor for APCO and NECI, as well as a New Jersey State Certified Police instructor. She is also an active member of the CISM (critical incident stress management) team, and a member of the New Jersey DRCC (disaster relief crisis counseling team). Monica has served as South Region Vice-President and served as Chapter President 2013-2014. Maria Teruel has been working for Xybix Systems, Inc. since 2016 as the Mid-Atlantic Territory Manager. Xybix Systems designs, builds, and implements ergonomic furniture solutions for 911 dispatch centers. When she is not traveling for work, she is often traveling to visit family in New York City, Atlanta, and Myrtle Beach. In her spare time she can also be found playing volleyball, training her puppy dachshund, or throwing axes in her local league. Maria joined the NJ-NENA Executive Board in July 2018. Kellie Goodell is employed as a telecommunicator by the Fort Lee Police Department and also serves as the current Chief of the River Vale Fire Department. Kellie began her career as a telecommunicator and has worked for the Borough of Emerson, Upper Saddle River Police Department, Westwood Police Department, before moving on to her current employer. Serving as co-secretary for the chapter with Chris Caroll, to ensure there’s someone to take meeting minutes and handle important paperwork. Chris joined NJ-NENA as a volunteer in 2015 and currently serves as Chief Telecommunicator for Burlington County Communications. Judy Hawkins started in the field of Communications back in 1993 as a Class 2 Special for the Montvale Police Department. In 1995 she began working part time for the Tri-Boro Dispatch Center in Park Ridge. In 1997 she became a full time clerk/dispatcher for the Northvale Police Department. Since August of 2001, Judy has been a Senior Dispatcher and 9‑1‑1 Training Officer for the River Vale Police Department. Since obtaining her Emergency Medical Dispatch Instructor Certification in 2005, Judy has been instructing at the Bergen County Law and Public Safety Institute. Judy has been a NENA member since 2006 and serves as conference chairperson. Gareth is serving as chapter president a second time, having served before in 2012 – 2013. He has over 30 years experience in Public Safety. He currently serves as Communications Director for the Union County Police. Gareth began his career in communications as one of the original dispatchers with the now defunct Atlantic Ambulance CenCom. He eventually was promoted to Communications Coordinator. Gareth has also been a NJ State Certified Paramedic since 1983, serves as the Union County OEM EMS Coordinator and serves on several state communication and EMS committees. A member of NENA since 1995, he held the position of Central Region Vice President for 7 years until moving up to 2nd Vice President in 2007 and 1st Vice President in 2011. He served two terms as chapter president in 2012 – 2013 and from 2016 – 2018.